Exploring Canada is real time consuming and over the past two summers we decided to explore Ottawa, the Capital City and Quebec City, the capital of Quebec Province. At both these places, we undertook walking tours of extremely different nature. On 31 December 1857, Queen Victoria chose Ottawa as the Capital of Canada being midway between Toronto and Quebec City and less prone to political mobs being a small city. Ottawa is the fourth largest city in Canada and is the most educated city with minimum unemployment. Ottawa with Gatineau, Quebec, on the West together form the National Capital Region (NCR). In effect half of it French speaking and the other half mostly English speaking. Every city in the world offers an amazingly rich history filled with scandal, scariness and intrigue. There are many a haunted buildings, places of worships, cemetery etc that one can find in any city. While in Ottawa, the capital city of Canada, we ran into The Haunted Walk, a walking tour company that conducts “The Haunted Walk Tour”, a walking tour around the city which commenced at 9 PM and ended by 10:30 PM for the reasonable rate of $15 per head. The hostess was Margo, a middle-aged lady, cloaked in black cape and carrying a lantern, gathered all the 15 participants near the Parliament building and briefed us about the tour and the safety aspects. She began with the haunting tale of the graveyard under our feet and continued across the street, under the canal, to Lisgar High School and all around the City spinning tales of long ago ghosts and even some personal tales. The fireworks from the Parliament building provided a perfect backdrop for all her ghost stories. Margo conducted us on the tour visiting important landmarks of Ottawa and with each place she had some hunting story to narrate, which she did perfectly, with complete “effects”. She did not use any props or any hysteric sounds as one anticipated. The tales involved the Lisgar High School, the Fairmont Chateau Laurier hotel, the Confederation Park and the Rideau Canal. It was the good old fashioned story telling with the stories apparently researched and edited beforehand. Leaving alone the ghost stories, the tour quite informative and useful in discovering the streets of Ottawa. Then we moved to the Quebec City. 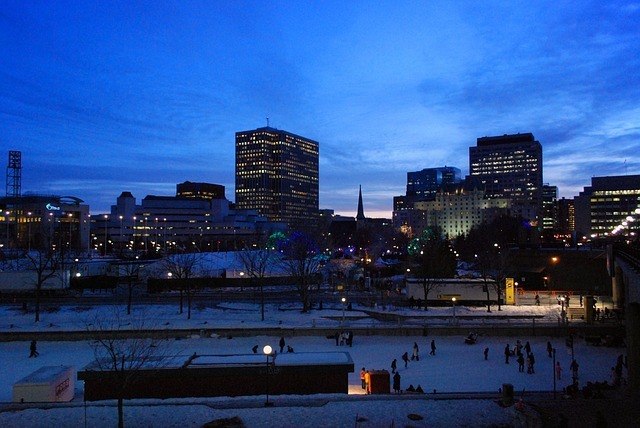 The crown jewel of French Canada, Québec City is one of North America’s oldest and most magnificent settlements. Its picturesque Old Town is a UNESCO World Heritage site. There is more than a glimmer of Old Europe in its classic bistros, sidewalk cafes and manicured squares. Québec City is 400 years old. It boasts four centuries of history marked by encounters with the First Nations, battles between the French and English, terrible epidemics, four centuries during which Québec has grown into the city forging a character of its own built around a thriving culture, economic success, urban transformation, neighborhood life, and the French language. Quebec City’s rich cultural heritage isn’t just in its architecture and historical leanings; it is in the food too. The Walking Tour was the Culinary Tour, which lasted over two hours, walking through the historic cobblestone laneways within and just outside of the old walled city, which dates back to 1535, when Frenchman Jacques Cartier established the original fort. During the tour we sipped many samples of wine, tasted various types of cheese, savoured the pastries, tasted various chocolates made from Maple syrup, etc. Jacques Cartier was sent on an expedition by Francis I, King of France, and he arrived at Quebec in 1534, taking possession of lands. In 1608, Samuel de Champlain made landfall on the north shore of the St. Lawrence River at a spot that the Aboriginals called Kébec. From here the New France in Canada expanded rapidly between 1660 and 1713. During the Seven Years’ War, the army of General Wolfe laid siege to Québec, and culminated in the defeat of the French General Montcalm in 1759. Four years later, with the signing of the Treaty of Paris, the King of France ceded to the British crown “Canada and all its dependencies.” From then on the Province of Quebec has maintained its French culture and language and thus Canada has two official languages – English and French. Robert, our tour guide explained all the details about the stories behind the dishes and also the influences of Amerindian, British and French cuisines in the Quebec cooking. The foodie stops included three restaurants, two treat shops, a liquor store and an old grocery. On the way, we passed the oldest Anglican cathedral outside Britain – built in 1804 — and still using human bell ringers every Sunday. In all these cities there were cycling tours too, but what impresses the most is the “Bixi” (Bike Taxi). Bixi is a network of 800 bicycles and 80 stations located throughout the city, to provide residents and visitors with an additional transportation option for getting around town, making active transportation simple, fast, and fun. The system includes a fleet of specially designed, heavy-duty, durable bicycles that are locked into a network of docking stations. Bixi is available for use 24 hours a day, 365 days a year, except during inclement weather conditions that might make the system unsafe. The station network provides twice as many docking points as bicycles, assuring that an available dock to return the bicycle is always nearby. To rent a cycle, you got to purchase the tickets online or from the kiosks, unlock the cycle from the dock using the code provided, ride the cycle and return it at any station by docking it. After undertaking these tours, I was sure that in India we can offer many such tours and even many more, in any city at any time. It may not be feasible to arrange a walking tour, but a “rickshaw” or “auto-rickshaw” tour is always feasible. We have ideas in India; abysmal implimentation…Simply do not have the skill sets, resolve, will, honesty and gumption.